If I accomplish nothing else today, I did make fresh muffins for breakfast. Preheat oven to 350°F. Grease muffin tins or place muffin wrappers. Stir together sugar and cinnamon for rolling. Beat sugar and egg until light and fluffy. Mix dry ingredients in a small bowl and then mix into sugar and egg mixture until well combined; mixture will resemble coarse crumbs. Add wet ingredients and mix until smooth, soupy batter is formed. Fill muffin cups until almost full. Bake 15 minutes, spinning once, until tester comes out clean. Remove from pans. 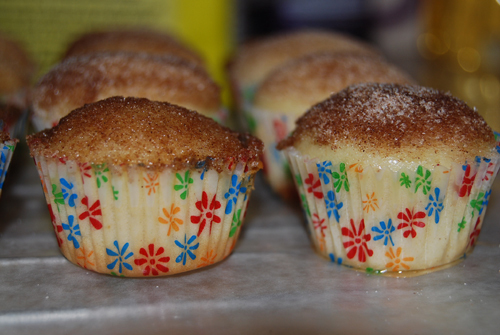 Dip tops of muffins in melted butter and then roll in cinnamon sugar mixture until tops are coated. Can be eaten warm or kept over night. Makes 24 mini-muffins or 12 regular muffins. I attempted to make an artier picture. Did it work?